For The Fisher-Person In All Of Us! Captain Billy Tyne (George Clooney) and his fishing crew are on the same mission that every other fisher-person wants, that is to bring home as much fish as possible and to make a killing (excuse the pun). Except this iron clad crew including top fisherman Bobby Shatford (Mark Wahlberg) are in it, to win it, and head for the treacherous Flemish Cap where the fish are plentiful and the weather, lethal. After their catch they sail straight into the storm of the century, some have called it, The Perfect Storm. 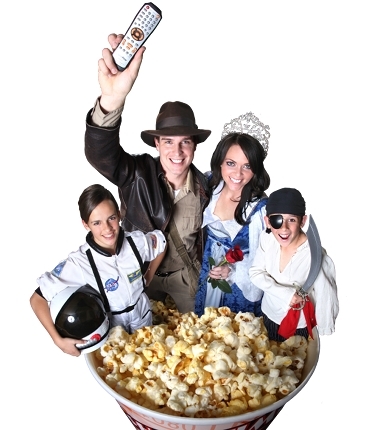 Based on true events, this brave team may be in for the adventure of a lifetime, with the only reward being survival. Ever since George Clooney was nominated for an Academy Award this year, I’ve been on a kick netflixing Clooney movies like crazy. One thing that I’ve come to realize is how versatile of an actor he is. He brings a calming talent to all of his roles but it works in chic flics, actions flics, espionage flics, etc. etc. Mark Wahlberg is another fine actor in The Perfect Storm, though I think he’s like a fine wine (or grape juice?) his acting keeps getting better with time! This film is one that will have you on edge almost the entire time, and the fact that it’s based on actual events seems to heighten the intensity that much more. 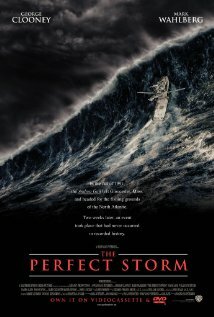 The Perfect Storm isn’t the perfect movie, but it’s one that you certainly won’t want to miss! 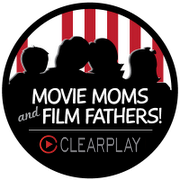 Motherly Advice: Every time I watch a PG-13 movie, I wonder what I ever did without Clearplay! This film, though it’s recommended for ages 13 and up, you’ll still want your filters on at least medium, want to know why? Ever heard of the saying, “So-and-so swears like a fisherman?” That’s why. Tons of swearing is cleared out, which is great but you do miss a lot of dialogue. Also, in the first fifteen minutes the characters hang out at a bar and drink a lot, smoke a lot, and make out with their girlfriends…a lot. Also, when the crew is out on their boat trip you see a shark bite a fisherman’s leg, a fishing hook go through a hand, and in general a lot of oceanic turmoil, which may make you a little sea sick. So with your filters set on medium this movie is perfectly OK to watch with your kids that are 13 and up. Trisha~I think the saying really goes, “Swear like a sailor”…but go with it!